Leading Aussie experts reveal what you need to do to stay in tiptop shape at every life stage. Fitness is important for setting your body up to cope with whatever life throws at you. “Once you hit 30, most women experience a drop in their basal metabolic rate, meaning the body doesn’t need as many calories to sustain itself”, say Dan Conn, Wellness Director at Collective Wellness Group. 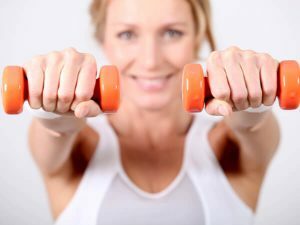 “Building lean muscle mass will help boost your resting metabolism and make maintaining or losing body fat a lot easier.” So pick up some weights and get pumping, ladies! Dr Ginni Mansberg says the only routinely recommended screening test in your 30s is the Cervical Screening Test – which is replacing the pap test. This test is done from age 25 every five, rather than two, years to look for human papillomavirus (HPV), a common virus in women and men. An HPV infection that doesn’t clear up can cause changes in the cells of the cervix, which could lead to cervical cancer, so it’s best not to skip it. “This is a time many women are transitioning into menopause,” says Chloe Dallimore, Director of International Training at Xtend Barre. “As a result, women in this age bracket often notice weight gain, particularly around the waistline and torso.” But fear not – Chloe credits cardio exercises as the best thing to torch kilojoules and reduce body fat. “Opt for high-intensity but low-impact workouts to get your heart racing,” she says. You qualify for a breast screen every two years after age 50, where the risk is higher, but women aged 40-49 also have free access to the Breast Screen Australia program, should they choose to have a screening mammogram. “A mammogram involves a two-dimensional, fairly uncomfortable, radiation-emitting specialised X-ray that picks up particular patterns typical of breast cancer,” says Ginni. It’s common amongst both men and women to see physical changes in their 40s. “As well as maintaining some aerobic exercises and strength training, it’s also a good time to reduce simple carbohydrates – like sugars – and switch to wholegrains,” says Cinzia. “Increasing a variety of leafy greens will also add valuable antioxidants,” she says. The average age of menopause in Australia is 51, but in good news, there are no routine health check needed – it’s more about being aware of what’s going on with your body. Menopause is defined as 12 months since your last normal menstrual period, and you don’t need a check for that,” says Ginni Mansberg. We don’t treat it because there are no necessary interventions, but we can treat hot flushes.” Other symptoms like sleepless nights can affect your energy levels, nutritionist Cinzia Cozzolino suggests reducing your coffee and tea intake to avoid further interruption to melatonin secretion. Joint care can be assumed at any age, but it’s your 50s and older when the aches and pains are noticeable. So how do we deal with it? Pharmacist and medical herbalist Gerald Quigley suggests we look to spices. “The herb of choice is turmeric,” he says of the natural drug-free approach to dealing with join pain and inflammation. “Traditional use is being supported by new evidence showing its effectiveness in blocking the production of the pain messenger signals when wear and tear occur in busy joints.” While you can add the spice into foods like casseroles, curries or even lattes, it can be tricky for your body to absorb it on its own. Gerald suggests consuming it in a daily, turmeric, BetaSorb supplement. It’s all about resistance training at this stage of your lie. “For women at this age, loss of bone density is a common side-effect of menopause, which is why weight-bearing and strengthening exercises are so important, says Chloe Daillimore, Director of International Trainings at Xtend Barre, who also stresses the importance of stretching. “Women often start to feel their bodies becoming a little stiff in their 50s, so stretching and lengthening exercises are another important part of a well-rounded exercise regime at this age. Keeping your cognitive health in tiptop shape should become a major focus in your 60s. “Once you get to 65, you get the first of your old-age health assessments,” says Ginni Mansberg. “GPs do a cognitive test every year, asking questions like, ‘Where are you?’ ‘What day is it today?’ ‘What season are we in?’ and then they start to get a little more complex. We also ask how many times you get up in the middle of the night to visit the bathroom, whether you have any difficulty feeding yourself because you can’t cut your vegetables and whether you can get to the shops. Not only can you keep your memory in check by doing activities like puzzles and problem solving, you can also find supplements to help aid cognitive function. “Ginkgo biloba has traditionally been used to support microcirculation, as an antioxidant, and to increase cognitive function, including poor memory,” says Go Healthy naturopath Peta Teruma. “The increased microcirculation may be beneficial for tinnitus, vertigo and for people who have cold hands and feet. The increased circulation and antioxidant component is what’s thought to support its uses for cognitive function and memory loss.” Meanwhile, Dr Mansberg says you’ll receive a pneumococcal vaccine once you turn 65, and a flu shot every year following. Come your 70th birthday, you’ll get a vaccine against shingles. “Many women’s coordination deteriorates in their 60s, says Chloe Dallimore from Xtend Barre, who says exercises that stimulate your “deep” muscles – such as Pilates – can be hugely beneficial for supporting your strength and balance. “Strong controlled movements that use your full range can hit these deeper muscles. When you perform those deep movements for an extended time, or with pause at the deepest point, the strong superficial muscles tire, and deeper ones take over,” says Chloe. Along with continuing regular, light weight training (two 24-45 minute sessions per week), Dan Conn from Collective Wellness Group also recommends Pilates. As we age, Vitamin D levels can tend to decrease because we spend less time outdoors. “Vitamin D is a vital nutrient that helps regulate calcium and phosphate in the body, and helps keep bones, teeth and muscles healthy,” says nutritionist Cinzia Cozzolino. “Many of our milks are fortified with Vitamin D and it’s a good idea to take a supplement if your levels are low.” In addition, it’s crucial to keep hydrated, particularly as you get older, because drinking water helps flush bacteria out of your system. Energy levels begin to deplete in your 60s, so Cinzia recommends keeping them high with things like fresh fruit and slow-burning carbohydrates such as vegetables, grains, psyllium hunks, brown rice and quinoa.